Like many Americans, I don't live near the graveyards where my ancestors are buried. Some are rural and poorly maintained, and it saddens me to see the disheveled condition of their final resting spots. If you share this experience and have the money to do something about it, a new service, Gravescape, can provide the attention your loved ones deserve. 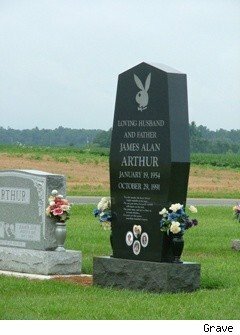 The company will attend to any grave in the lower 48 states, adorning it with your selection of flowers or plants, trimming grass and weeding it, then send you a digital photo to confirm the work has been done. The service doesn't come cheap, however. Expect to pay over $50 for a yellow heart bouquet, $100 and change for a saddle to rest atop the tombstone or a spray to rest at the foot. Planting of live flowers will run around $125. All include minor cleanup and confirming photos. For dispersed families who are willing to share the cost, gravescape.com seems like a product that would serve the need. I wonder how much they would charge to plant a watermelon on my grave? Instead of spending resources on huge bouquets of gorgeous flowers, green-minded families choose to give tributes to charity and bury their loved ones in burial shrouds instead of caskets. When he passed on into eternity, Dr. Frederic J. Baur chose to have his remains buried in his proudest invention: the Pringles tube. We can't make this stuff up, folks. Does dying gracefully mean foregoing paid involvement in your funeral? That's what some people think, and so the DIY funeral industry is formed. This story isn't really that shocking -- mostly, people are planning the details of their own service and not digging their own grave. But is it sensible, or strange? When Chicago Heights beer lover Bill Bramanti passes on, he'll be caried to eternity in a Pabst Blue Ribbon coffin. Don't worry skeptics: he'll fit in it. He's already tested it out. As Bruce Watson points out, there are a bunch of great ways to use your body parts after death. Your skull could become a drinking vessel, perhaps. Or you could donate your body parts to a medical school, or a museum! The possibilities are endless. And think of the money you'll save. Rather than go with a classic burial, many families choose other options, from reeef burial to being shot into space. Sure to forever change the dialogue between rival sports fans, the Major League Baseball urns and caskets allow you to be buried in a coffin proclaiming your love for the Cubs, Yankees, Red Sox or Dodgers (or a few other teams). No telling how many bitter spouses and children have decided to spend $4,499 ($799 for the urn) to finally pay their loved one back for ignoring them to watch baseball, burying dear ol' daddy in his least favorite team's colors.